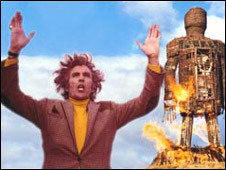 Plans to film a sequel to the cult movie The Wicker Man have been halted due to "financing problems". Cameras were due to start rolling in Dumfries and Galloway this month on the follow-up to the 1970s film starring Edward Woodward and Christopher Lee. However, a statement from the local council confirmed that producers had cancelled the shoot due to last minute difficulties with finance. Councillor Gill Dykes described the news as "bitterly disappointing". The original 1973 film, written by Anthony Shaffer, was shot at a number of locations throughout Galloway. It was planned that the sequel - based on director Robin Hardy's book Cowboys for Christ - would also be filmed in the region. However, those plans have been dropped for the time being. Ms Dykes said the decision would have a severe financial impact. "The company were about to start casting for extras and around 90 crew and cast were booked into local accommodation for a four week period," she said. "This is a big blow to them. "We will maintain contact with this interesting project and I can only hope we'll be top of their location list if the financial problems get resolved." A council statement said the production company was looking to put alternative funding arrangements in place. It added that if filming had to be cancelled entirely any funds committed by the authority would be returned.